If you check the boxes I have in my room with the materials I collect and I “hope” to use in crafts, you will be surprised! I have to many useless things and I am still trying to find a way how to use them. For example, my latest passion is to collect the small scraps from yarns or ribbons, especially if they are in my favorite color. And then I am trying to use them somehow. 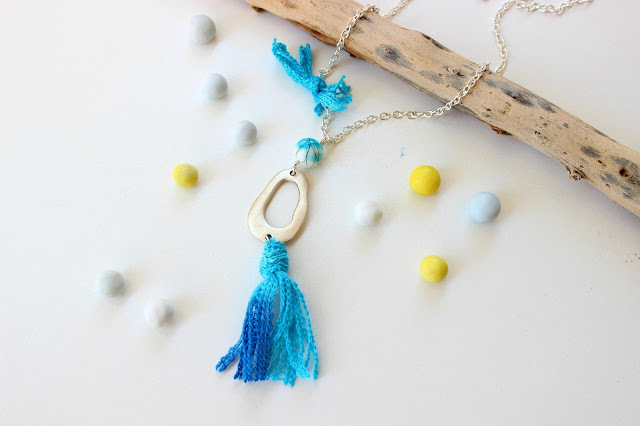 So if you are “crazy” like me and you keep yarn scraps, let’s make a beautiful and easy Tassel Necklace!!! Let’s start by creating our pendant. 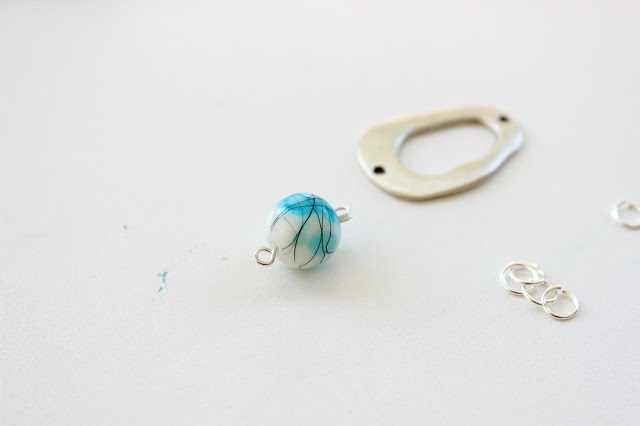 Use a pin and a jump ring to connect the colored bead with the large normal link. 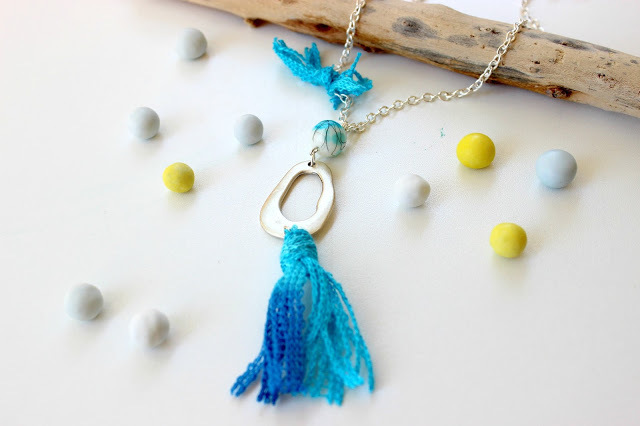 Cut a large piece of the silver chain, according how long you wish your necklace. 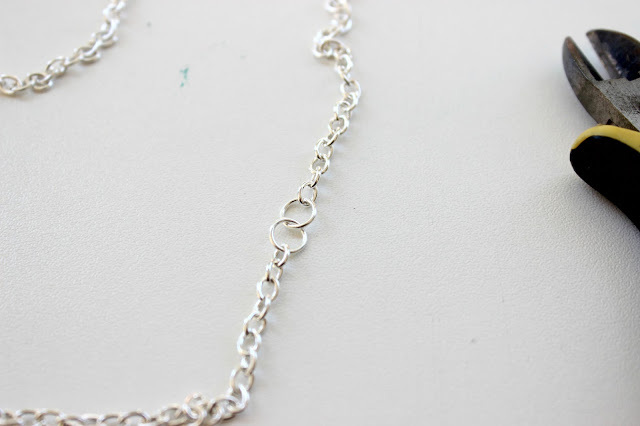 Use a second jump ring to connect the pendant with the chain. 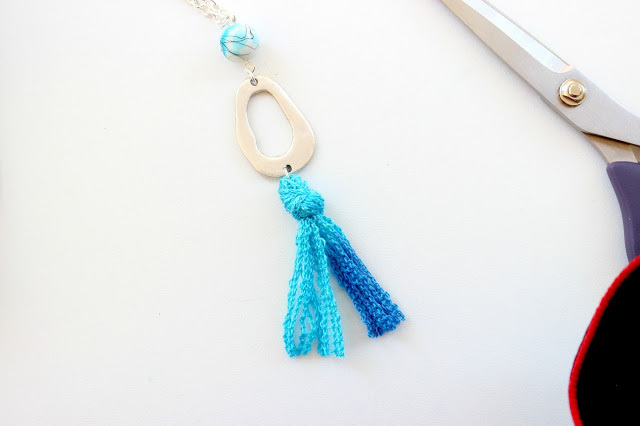 Since the necklace is long, there is no need to use a lobster, but close the two edges with jump ring. The main necklace is ready. Let’s use the yarn scraps now. 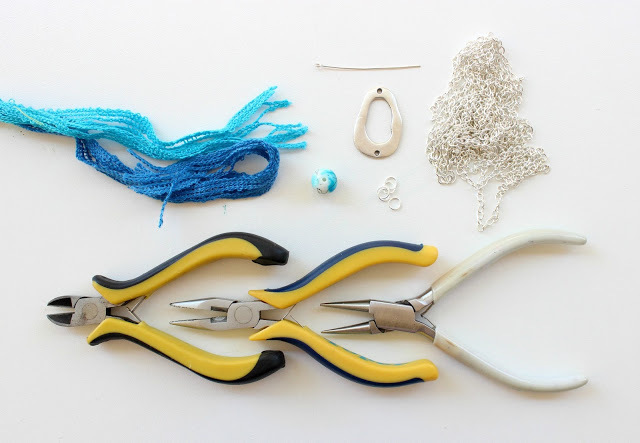 Use a large piece of the yarn, pass it from a jump ring which is connected to the free side of the link and make a simple knot. 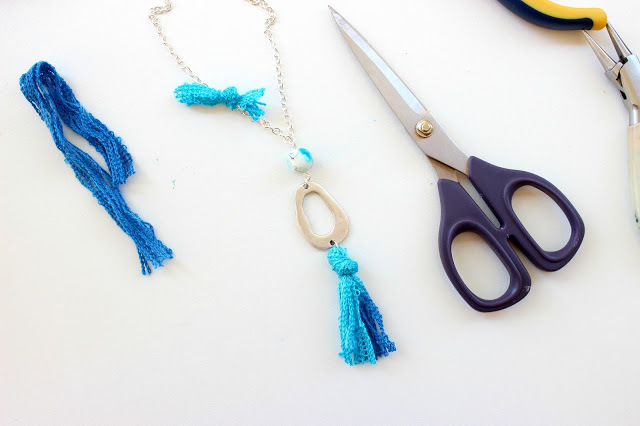 Cut the remaining yarn pieces and your tassel is ready! 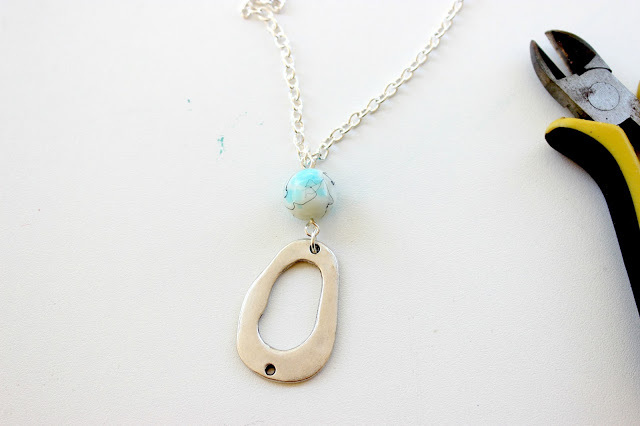 I love to have small details on my jewelry, so a tiny turquoise sparkle on the chain will make it even more cute. 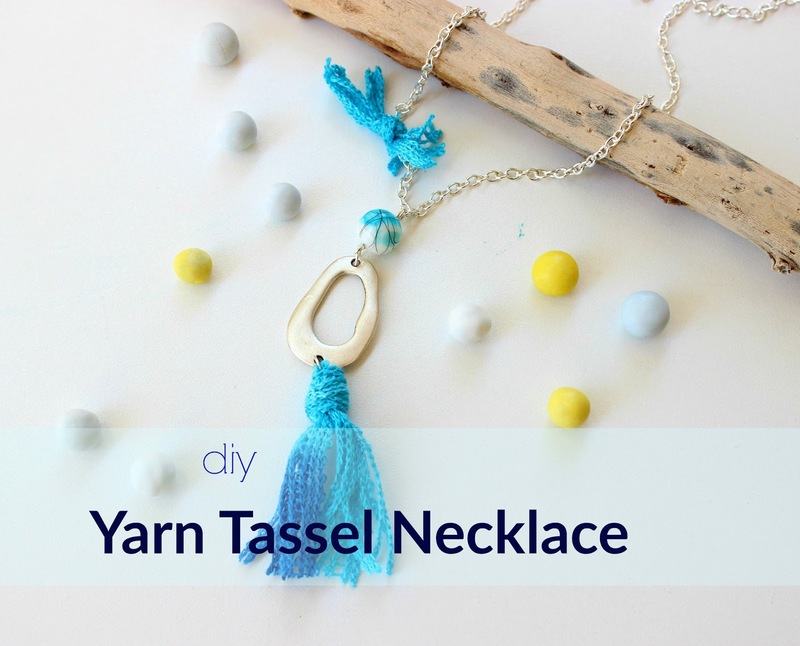 Just use a small scrap from the yarn and make a simple knot on the chain! Your necklace is ready! Full of minimal but full of colors and just great to enjoy it with monochrome style or a more Summer one! If you do not have any yarn like the one I have used, you can use any yarn scrap you have but add more threads in your knot. Also, try it with fabric scraps… it is also gorgeous! Ναι λοιπόν είναι τσαχπίνικο και πανέμορφο! It's so perfect for summer! I love it! τι όμορφο!και με τα χρώματα του να μας θυμίζει για λίγο ακόμη τη θαλασσα! Και το χρώμα που διάλεξες μου αρέσει. Πολύ ωραίο και τρελούτσικο αποτέλεσμα και θα συμφωνήσω ότι θυμίζει θάλασσα, καλοκαίρι, Ελλάδα. Τέλειο Ζήνα και σε άκρως καλοκαιρινό μπλε να μας θυμίζει την απέραντη θάλασσα! Πρέπει να το αποφασίσω να πάρω τα εργαλεία για να φτιάξω όλα αυτά τα υπέροχα πράγματα που μας δείχνεις!